The views are beautiful! I love the close proximity to downtown Cannon Beach for restaurants, shopping, and sight seeing while still being far enough away to feel secluded. Beautiful, quiet neighborhood. Friendly people. So many wonderful features about this house. We will definitely be visiting again soon. The location is fabulous, sparkling clean with all the amenities. You can hear the ocean waves with the windows open, views of the water and easy few steps to the beach. Truly enjoyed our weekend here and highly recommend this home! Outstanding, knowledgeable and very personable team. I might of rented another property if it were not for Cynthia. She really sold me on the property. Absolutely lovely and charming cottage in a superb location! Flip Flop Friday was a great place! This home is immaculate, and comfortable. The kitchen is fully equipped with everything you could need. 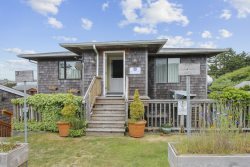 Ocean view, short walk to direct beach access. There is a small park with picnic area for little ones directly across the street. We will Definitely be back! I cant explain how amazing this house and property is! Secluded yet so close to the beach! I will be coming back! We enjoyed our stay at Quail Cove and love Cannon Beach!